New t-shirt from Rise After Defeat designed by UomoTigre (Dagger Tattoo - Dagger Design). White, red and black print on white Fruit Of The Loom t-shirt. 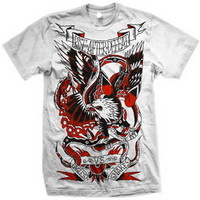 This item is a pre-order, the shipping date is June 20, 2010.